Learn how to make Classic Chocolate Mousse that is decadent, airy and intensely chocolatey. In a medium heat-proof mixing bowl, combine 6 oz chopped chocolate, 6 oz butter, 1/4 cup coffee. Heat a medium saucepan with 2-inches of water to a boil. Place your bowl with chocolate over a saucepan of simmering water so the bowl over the steam and not touching the water. Stir until chocolate is melted and smooth. Remove from heat and set aside. Separate eggs and put 4 yolks in a large heat-proof mixing bowl with 1/2 cup sugar and 1 tsp vanilla extract. Whisk to combine. Place bowl over the saucepan of boiling water, and whisk until thickened, hot to the touch and lightened in color. Remove from heat. Use a spatula to stir chocolate mixture into the egg mixture, mixing until blended. Place 4 whites in a third medium bowl. Beat until foamy. Gradually add 1 Tbsp sugar and continue beating until medium peaks form. Fold egg whites into the batter one third at a time, fully incorporating between each addition. Once all egg whites are in, stop folding when mousse is smooth and even in color. Divide mousse between 8 (4oz) ramekins, cover and refrigerate at least 2 hours or ideally overnight. In a medium bowl, beat together heavy cream with 1 Tbsp sugar and 1/2 tsp vanilla extract on medium/high speed until soft peaks form. 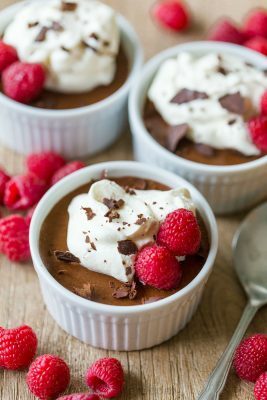 Spoon generous dollops of whipped cream over chilled chocolate mousse cups and top with shaved chocolate and raspberries. What you will need: 1 medium mixing bowl, 1 medium heat-proof bowl, 1 large heat-proof bowl, 1 medium saucepan filled with 2" water.